Late Wednesday afternoon I took a walk north along the Promenade, across the pedestrian bridge to Pier 1, south along the Brooklyn Bridge Park walkway to Pier 5, then up Joralemon to home on Montague. 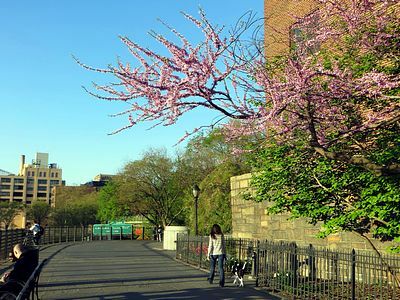 Cherry blossoms provided a splash of color at the Promenade’s north end. 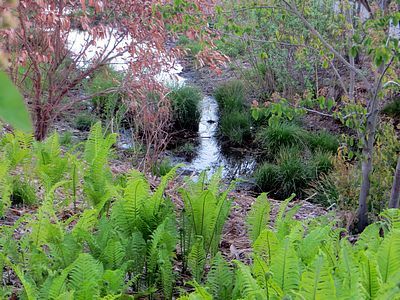 Brilliant green ferns on the Pier 1, Brooklyn Bridge Park uplands. 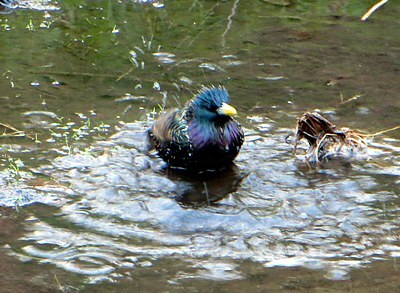 A starling bathes in the watercourse that runs along the landward side of Pier 1. 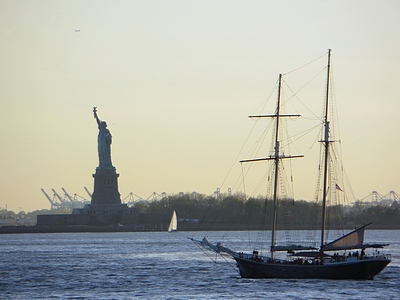 Clipper City is seen from Pier 1 heading out from South Street Seaport for an early evening cruise. 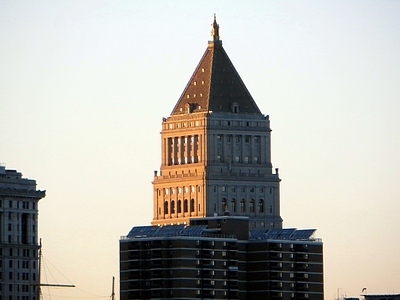 The top of the Thurgood Marshall Federal Courthouse, at 40 Foley Square in Manhattan, is seen from Pier 1 projecting over a 1960s vintage apartment building that has more recently been fitted with an impressive array of rooftop solar energy collectors. The Courthouse was one of the last buildings designed by Cass Gilbert, perhaps best known for the Woolworth Building. Another architectural superimposition. 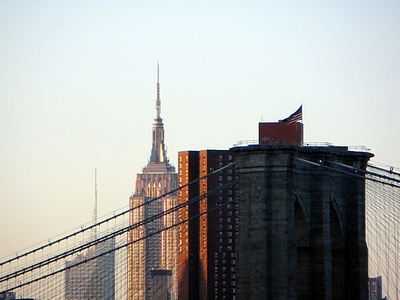 In the foreground is the West (Manhattan side) Tower of the Brooklyn Bridge (John A. Roebling, 1883). Behind it looms Confucius Plaza (Horowitz & Chun, 1976), a 44 story apartment building. To the left of that, in the distance, is the Empire State Building (William F. Lamb; Shreve, Lamb & Harmon; 1931). To its left, in the far distance and topped by a slender spire, is 4 Times Square, the Conde Nast Building (Fox & Fowle, 2000). 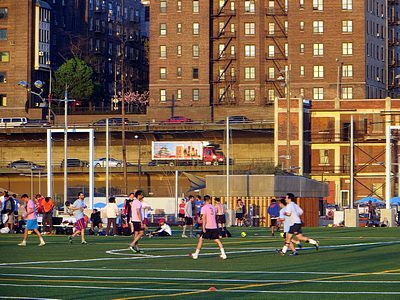 There’s soccer action on the Pier 5 playing fields, and heavy evening traffic on the Brooklyn-Queens Expressway.